1B Umpire Lance Barksdale ejected Mariners Manager Lloyd McClendon for arguing a check swing (strike three) call in the bottom of the 8th inning of the Rays-Mariners game. 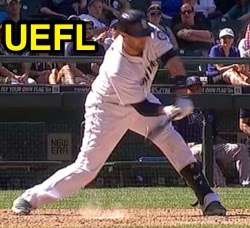 With one out and one on, Mariners batter John Buck attempted to check his swing on a 3-2 splitter from Rays pitcher Joel Peralta. Replays indicate Buck attempted to strike the decisive pitch, the call was correct. At the time of the ejection, the Rays were leading, 2-0. The Rays ultimately won the contest, 2-0. This is Lance Barksdale (23)'s first ejection of the 2014 season. Lance Barksdale now has 4 points in the UEFL Standings (0 Previous + 2 MLB + 2 Correct = 4). Crew Chief Gary Cederstrom now has 1 point in the UEFL's Crew Division (0 Prev + 1 Y = 1). This is the 45th ejection of the 2014 MLB Regular Season. This is the 17th Manager ejection of 2014. This is the Mariners' 4th ejection of 2014, 1st in the AL West (SEA 4; TEX 3; HOU 2; LAA, OAK 0). This is Lloyd McClendon's first ejection since May 3, 2014 (James Hoye; QOC = U [USC]). This is Lance Barksdale's first ejection since Aug 28, 2013 (Dale Sveum; QOC = N [Check Swing]).